Lhotse Glacier from the Island Peak trail with view of Lhotse and Lhotse Shar in the background by Christopher Parsons. Charity sponsors Rab recently spoke to contributing artist and competition winner Christopher Parsons for their blog. In an expedition supported by The Glacier Trust Chris spent three weeks traversing the trails around Lhotse in the Sagarmatha region. Taking inspiration from the scientists he was travelling with he gathered samples from different areas of the glaciers to be cultured by a microbiologist on his return to the UK. The results will become part of his final artwork as he juxtaposes the microscopic with the macroscopic. 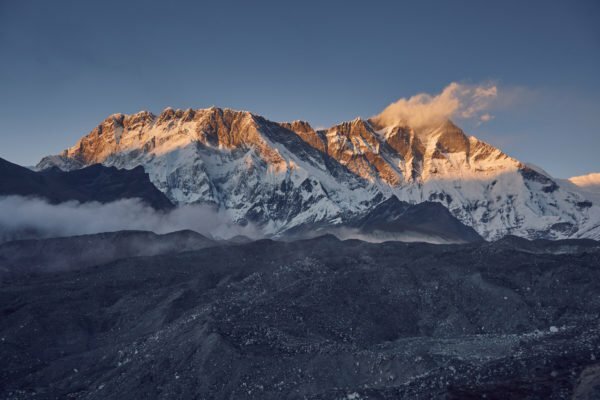 Glaciers in the Nepalese Himalayas have suffered significant decline in recent years with research suggesting there is as little as 50 years before deglaciation leads to a crisis in water availability (ICIMOD, 2017). This underlines the need to document these glaciers and highlight the impact of climate change before it is too late. Read The Life and Death of a Glacier on the Rab website.